Rod Decker nails it in this brief paper he delivered at the recent Bible Faculty Leadership Summit, a get-together of professors from Fundamentalist Protestant schools. 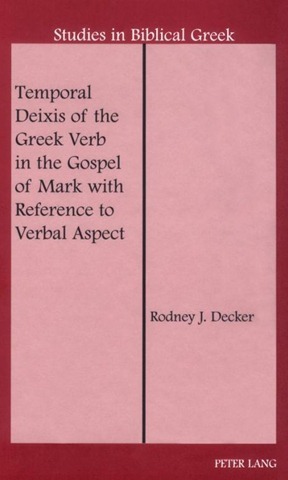 Decker knows whereof he speaks, having published a work on linguistics (pictured) in Carson’s Studies in Biblical Greek series. Unfortunately, much conservative theology of the past century focused on word studies, probably due to a truncated understanding of verbal inspiration. Yes, the words are inspired—the exact words God wanted used and all the words of the original texts (i.e., verbal plenary inspiration)—but those words are only the building blocks for the syntax and the larger literary structure—which are equally inspired. Words, syntax, and structure are essential to communicate propositional truth. Yet theology is too often done by discussing individual words. This methodological error is perpetuated and encouraged by the frequent citation in the theologies of individual Greek words, usually parenthetically and seldom with comment. Doing so contributes to the perception that theology is based on the individual words. I would make one final appeal to my friends in the theology department: stay reasonably current in discussion of the languages. Don’t rely on your seminary training from many years ago. If you get the impression somewhere that you missed a relatively recent grammatical revolution, be advised that there have been no revolutions in the understanding of the languages in the last 50 years, but progress is steady, if slow. But progress it is. We do understand the languages better than did the generation before us, for by standing on their shoulders, we can see just a bit farther—enough farther in some cases to avoid some mistakes and misconceptions of our fathers. We are also a bit more modest these days (or at least ought to be) in what we can “prove” with the biblical languages. In a sincere effort to reflect an inspired, inerrant text, our predecessors sometimes overstated their case with a maximalist approach to grammar and word studies. Though grammar and lexicon are indispensable, we must be cautious not to push them beyond what their weight will bear. I couldn’t say a louder amen. Read the whole thing. Definitely one of the top three papers at the event. What were the other two? =) I think I may try to weasel my way into going next year, like I did in 2008 when it was held at BJU. I enjoyed Stallard’s (on the Gospel) and Bauder’s (on Fundamentalism) – particularly because of the discussion they provoked. Bruce Compton’s (on church discipline) Jeff Straub’s (on AH Strong’s relationship with his son) were also great. The presentation on the Christology of Islam (not an official paper) was helpful.